CLAREMORE, Okla. — Christmas came a little early to Rogers County on Friday. 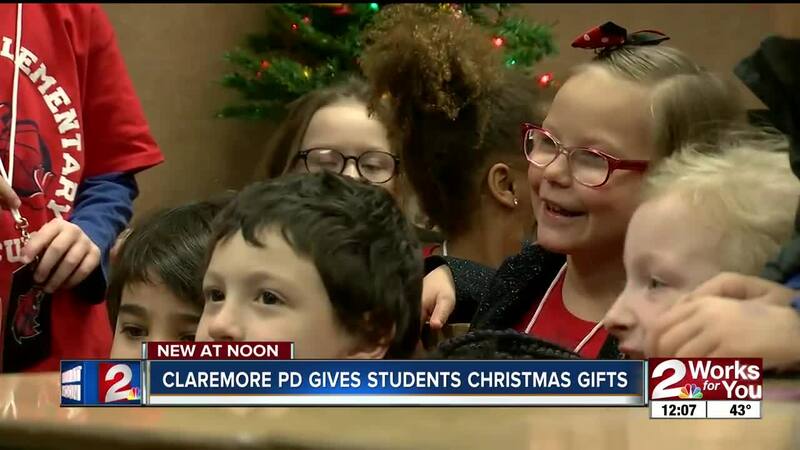 The Claremore Police Department had a special present for the entire Claremont Elementary School. A room was with boxes full of presents for every boy and girl. Each student waited anxiously for Jolly Old Saint Nick. "Who wouldn’t be?" said third grader Mark Knapp. Claremore Police Officers helping to spread holiday cheer with Toys for Tots for the third year. "I get chills watching our children get gifts from Santa," said Cindy Ramsey, a reading specialist at Claremont Elementary School. "I know this is probably going to be the best day of their life." Santa called each child by name. "It creates such a special memory for them and we’re really blessed for our students to be able to experience that today," Ramsey said. "I got a Lego," said student Ben Schell. Using No-Shave-November, the officers raised almost $14,000 to buy presents for more than 400 students. The officers also reached to the community for donations. "It just shows the heart of our town is for our kids," Ramsey said. The police chief said their hope is for the project to grow and reach even more schools.